The Sioux Falls, S.D. 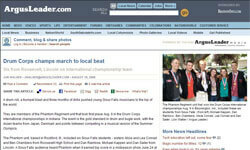 Argus Leader recognized six local students for winning the 2008 Drum Corps International World Championship as members of the Phantom Regiment. The six are part of a larger group of 17 from the Sioux Falls area who were members of drum corps this past summer including Carolina Crown, Blue Stars, Madison Scouts, Colts and Pioneer in addition to the Phantom Regiment. Read the article on ArgusLeader.com. The Vicksburg, Miss. Post profiled Phantom Regiment tenor drummer Nicholas Manton after returning home to the Vicksburg area after the corps won the 2008 DCI World Championship. Manton attends the University of Southern Mississippi. 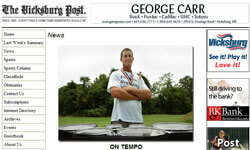 Read the article on VicksburgPost.com.